Vanilla Bean Cheesecake – Cheesecake made with vanilla beans and then layered with a vanilla bean white chocolate mousse. The creamiest, dreamiest cheesecake you’ve ever had! A year ago, I had zero cheesecake recipes on the blog. ZERO. And now, I’m sharing the second one for you! But before we get to it, let’s not forget the first…this incredible Snickers Cheesecake. So creamy and full of various textures but so decadent that one slice was more than enough. Today I have a cheesecake that is the polar-opposite of that Snickers version. This one has sweet flavor and creamy texture, whereas the Snickers version had rich flavor and chunky, sticky texture. So what exactly is this new cheesecake? Why it’s a Vanilla Bean Cheesecake, of course! But the name doesn’t do it justice… not only is it loaded with a total of THREE vanilla beans, it also has three layers: vanilla bean cheesecake, vanilla bean white chocolate mousse, and fresh whipped cream. Okay enough with the teasing – check this baby out! This cheesecake is a miracle worker – not only did it get me to like vanilla cheesecake, but it also got me to like white chocolate. I’m more of a Snickers/Oreo/triple chocolate cheesecake person so I usually stayed away from the plain, vanilla cheesecake. And white chocolate has just never been my thing. So this vanilla bean cheesecake is not one that I would have ever ordered on my own. That all changed when I started working at TGI Friday’s. A coworker had ordered this cheesecake and asked me if I wanted to try it. Not one to turn down free food, I tried a bite. And thank goodness I did! I was so shocked by the thickness of the cheesecake and the creaminess of the mousse. I couldn’t even really taste the white chocolate – just incredible vanilla bean flavor. My life had changed forever. To make the cheesecake, you really aren’t doing much extra work than your typical cheesecake. You make the crust and cheesecake batter, like you do with every cheesecake. But you also make a vanilla bean white chocolate mousse and then layer that on top of the cooked and chilled cheesecake. It only adds a couple more steps, but man is it worth it! When making a cheesecake, you need to use a springform pan. This will make it easy to release the cheesecake from the baking vessel once it has cooled. The cheesecake takes some time to make because you have to bake, chill completely, add the vanilla bean mousse, and then chill for a couple more hours. So make sure you plan ahead! To make sure the cheesecake cooks evenly without cracking, we cook the cheesecake in a hot water bath. If you’re not comfortable with this process, you can skip it. But just be aware that you may end up having to cook the cheesecake a little longer and it may crack. When making the cheesecake batter, the cream cheese must be room temperature or else it will be impossible to mix with the other ingredients. Speaking of the cream cheese, make sure you are using blocks of cream cheese, not the cream cheese from a tub. Block cream cheese is the perfect moisture for baking where tub cream cheese can have added ingredients to make it easier to spread. Make sure you use white chocolate that is made to be melted – which means you should not use white chocolate chips. I tried to melt some that I had and they would not melt, no matter how hot they got. So I used melting chocolate disks from Ghiradelli. You can find them in the baking ingredients aisle. The vanilla beans I purchased were rock-solid so I couldn’t split them to get the seeds out. So I just soaked them in warm water to soften them a bit – maybe 30 minutes or so. Alright guys – that’s all there is to it. You gotta try this cheesecake – it’s a great option for Easter coming up next month! If you guys have any other cheesecake recipes you want me to try out, let me know in the comments below! Cheesecake made with vanilla beans and then layered with a vanilla bean white chocolate mousse. The creamiest, dreamiest cheesecake you've ever had! Preheat oven to 350 degrees. Line 10 inch spingfoam pan with aluminum foil and form tightly around the edges of the pan. Add crumbs and sugar to a medium bowl and toss to combine. Add melted butter and use a fork to mix together. Pour into prepared pan and flatted with your hands or a flat-bottomed cup into one even layer. Bake for 10 minutes. Remove from oven and set aside to cool. Reduce oven to 325 degrees. Grab a large roasting pan. Make sure cheesecake pan will fit on the inside. Begin boiling 4 quarts of water. This will be used for the water bath. In the bowl fitted for a stand mixer, add cream cheese, sugar, and seeds of 2 vanilla beans. Beat until combined and smooth. Mix in eggs, one at a time, making sure to scrape down the sides of the bowl after each egg. Add sour cream and heavy cream. Mix until combined. Tap the bowl on the counter about 30 times to remove air pockets from the batter. Pour batter over graham cracker crust and place cheesecake into roasting pan. Place pan into oven. Very carefully, pour boiling water into roasting pan to create a "bath" for the cheesecake. Make sure water reaches half up the side of the cheesecake pan. Bake cheesecake for about 65 minutes until set but still jiggles in the middle. Turn off oven and leave cheesecake in for 10 minutes. Remove from oven and remove cheesecake from roasting pan and set on wire rack to cool for 30 minutes. Refrigerate for 8 hours or overnight so that cheesecake is completely chilled. Melt white chocolate in a microwave safe bowl 30 second increments, making sure to stir between intervals, until melted and smooth. Set aside. In a bowl fitted for a stand mixer, beat heavy cream until soft peaks form then add sugar and whip until stiff peaks form. Scoop into another bowl. Using the dirty mixing bowl for the stand mixer with a paddle attachment, beat cream cheese with seeds of vanilla bean until smooth. Add white chocolate and combine. Add in half of the whipped cream mixture and fold with a rubber spatula until nearly combined, then add remaining half of the whipped cream mixture and fold until combined and no streaks remain. Pour over cold cheesecake and spread into an even layer. Refrigerate for l 1 1/2 hours. In a mixing bowl fitted for a stand mixer, whip heavy cream with vanilla extract until soft peaks form. Add sugar and whip until stiff peaks form. Run a knife around edges of cheesecake then spread whipped cream over mousse layer within 2 hours of serving. To serve remove foil from pan, pull latch and remove springform pan ring. Garnish with white chocolate shavings or fruit, if desired. I’ve been wanting to make a cheese cake for years (never bought a spring form pan) but was too scared to try (after reading how hard it is). I saw this VANILLA BEAN cheesecake recipe, so I bought the pan. Mmmm, cheesecake…. Seriously, this simple, classic version of cheesecake is probably my favorite approach. It looks so good and I love that you used real vanilla beans. It looks delicious! I love seeing all of those vanilla beans in this! It sounds gorgeous, I can’t wait to make it! The beans are my favorite part! Love them! Thanks so much! Let me know if you come up with any killer recipes! This cheesecake is *beautiful*! I admit that I do not like (hate! loathe!) cheesecake, but it’s my husband’s favorite, so I make him one for his birthday every year. AAdding this to the birthday cheesecake list! I hope he enjoys this one! nice job. I could almost taste it! wow ! 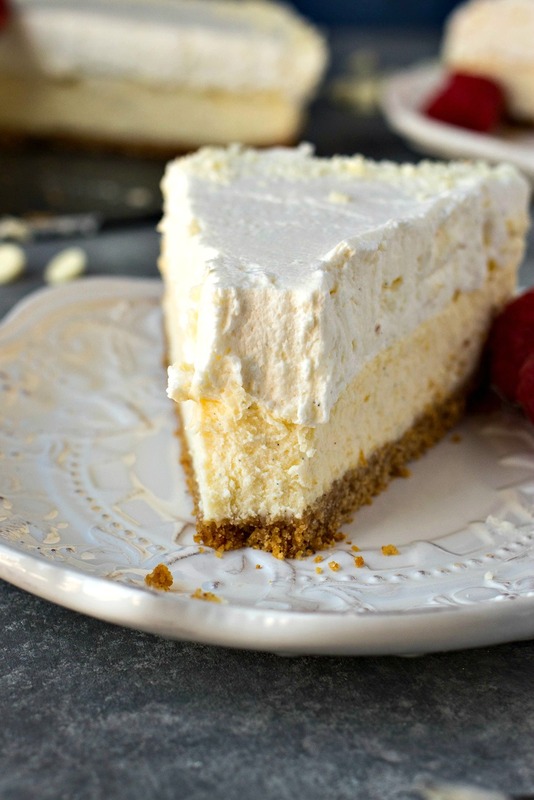 I love a simple vanilla cheesecake, it really is the only kind of cheesecake I will eat … you’re recipe is wonderful and makes me want to make it right now ! This cheesecake looks perfect! So fluffy and creamy, will add it to my ‘must make’ list! Wow! This cheesecake looks spectacular!! im absolutely loving this creamy and classic cheesecake. Holy moly! That is 2 layers of heaven right there! Your cheesecake looks absolutely amaaaazing! I can’t wait to try this out, I am a huge fan of cheesecake, especially a simple vanilla one! Homemade cheesecake is just the best! We make cheesecakes instead of birthday cakes a lot of times- can’t wait to try this recipe out! Yum! This cheesecake looks absolutely beautiful and delicious. I’ve never made a vanilla bean cheesecake before, so I am definitely saving this to try later. OMG cheesecake and mousse?! I want it! Vanilla is an all time classic flavor and nothing can beat a good Canilla Cheesecake! Yours looks amazing. white chocolate work for me. This is the perfect ending to a great meal. Company worthy for sure. I’m a chocolate-lover, but there’s still nothing quite as satisfying as a vanilla recipe made with real vanilla beans. Yours is beautiful!